It's easy to see why the movie has been rated so highly, and Jordan Peele's first venture outside of comedy has proven to be a risk that paid off. I somehow ended up with a review copy of this movie for the site, and I think it was due to originally being tasked with reviewing Split, only to never receive it. That’s fine, as I actually wanted to see this movie. The movie stars Daniel Kaluuya (Black Mirror) as a photographer named Chris who is about to spend the weekend with his girlfriend Rose (Allison Williams) at her parent’s house for the first time. Chris is nervous, as he is a African-American man dating a white woman, and is worried her parents will have an issue. Everything seems fine at first, as both Rose’s parents (Bradley Whitford and Catherine Keener) seem very accommodating, if not overly so. However, their behaviour starts to make Chris uncomfortable, as well as the attitudes of their groundskeeper and maid, both African-American, are very strange and almost sedated. As the weekend goes on, Chris finds out the family is having an annual get-together that same weekend with some friends and family. When Chris meets them, each acts more suspicious than the last, leading Chris to do a little investigating of his own, especially after coming across the only African-American guest at the party, a suspicious man named Logan (LaKeith Stanfield), who Chris is positive he knows from somewhere else, but Logan acts as if they have first met, not to mention is acting and dressing like he came from another century. Without spoiling to much for those who haven’t seen it, Chris’ investigating leads to different bizarre pieces of evidence that all point to absolutely nothing he is seeing being on the level, and that his initial fears of racism may not be unfounded, and in fact may be more extreme on a level he couldn’t have possibly imagined. Overall, I really enjoyed this movie. I’m generally not big on American horror films (most of them are absolute trash), but this was a clever, well-written and performed movie with an original take on a version of a classic horror trope. It’s so strange knowing that it’s written, co-produced and directed by Jordan Peele (MadTV, Key & Peele), due to his firm establishment in the comedy genre, but he clearly has a talent for other genres as well (he is rumoured to helm the live-action Akira film). It’s not the ground-breaking film I heard so many people describe it as, but it’s still very, very good, and probably the best American horror film I’ve seen in who knows how long. The Blu-Ray is your standard fare, including DVD and Digital HD viewing options, and features the standard bonuses like deleted scenes, director commentary and some behind-the-scenes featurettes. If you’re like me and you buy movies just to own and watch them, this won’t make much of a difference. If you’re big into special features, however, there’s not much here. There is a bonus alternate ending, though, that had never been seen prior to home release, so that is definitely a selling point for many. 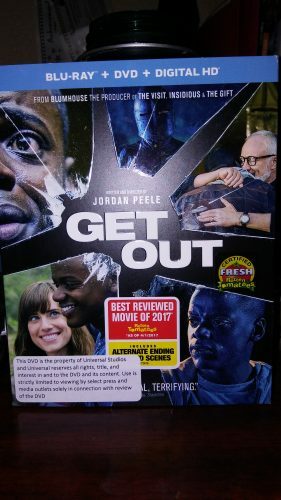 Get Out is a great film, and if you’re a fan of horror, horror-comedy or anything involving Jordan Peele, it’s a worthwhile addition to your collection. Peele’s first non-comedy effort is a home run, and I look forward to what else he comes up with in the future.